Chief Operating Officer for SAMSA, Sobantu Tilayi confirmed together with TNPA, SAMSA provided technical support during the multi-vessel emergency operation. This was as a result of the major storm that hit Durban at about 09h30 this morning. An emergency meeting was convened at approximately 11h30 today with Mkhize and Miya to form a joint command and engage on the re-floating for the vessels MSC Innes, SM New York, Bow Triumph and SA Shipyard floating dock with the new harbour tug. The meeting also dealt with vessels MSC Susanna and Maritime Newanda that broke moorings and had to be held by harbour tugs to prevent them also running aground. The vessel, Bow Triumph, a 183-metre long product tanker, which was berthed in Island View broke its moorings and ran aground on the sandbank near the Island View Terminal. The vessel was re-floated at 16h30 and it took further effort to clear the anchors which were still stuck. All re-floating operations were completed at 17h30 and the vessel was allocated a berth overnight for damage inspection. 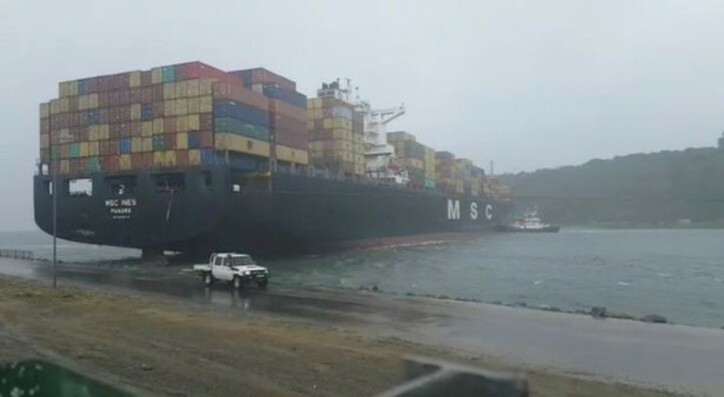 The vessel, MS New York, a 330-metre long container vessel, which ran aground near Maydon Wharf was also re-floated successfully and was allocated a berth for damage inspection. By 7 pm tonight the vessel, MSC Susana, which had earlier broke from its mooring ropes, was secured. The Maritime Newanda vessel which broke loose was held by tugs and is currently berthed at Maydon Wharf.